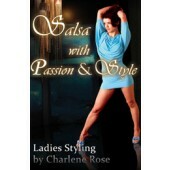 Charlene Rose is among the likes of great talent in the salsa world. She has performed, given workshops and taught classes internationally; and if you happen to be one to study under Charlene, you'll find that she embodies passion, style and grace within the movements of this great genre of dance. Charlene has been noted to be a precise, meticulous instructor and utilizes the extensive training she received from many years under instructors from such prestigious companies as The Pittsburg Ballet, The Boston Ballet, American Ballet Theater, the Pacific Northwest Ballet, and Cornish College of the Arts in Seattle, Washington. Why salsa dancing? Charlene would explain that her passion for salsa stems from it's cultural roots, the rhythms and the people who came before her. Her aim in life is also to grow and find her "own" voice through salsa and she sought out venues that challenged her talents as well as those of her competitors. Aiming her direction in the salsa scene was the perfect choice and with her credentials, the salsa world was happy to embrace Charlene. In the fairly brief time Charlene has been exposed to latin dance she has had many impressive accomplishments. She is a four time undefeated competitor of the "Mayan International Salsa Competition" in Los Angeles California, received a standing ovation for her performance at the 2002 "New York Salsa Congress", and has performed at other various Salsa Congresses and events internationally. Charlene Rose is by far a blossom in the rough. With salsa's history of being a male dominated forum, she acknowledges the fact that salsa today is a more contemporary style than what it once was. "I'm proud women today are making their own choices in the salsa scene and showing the world they have a name with talent."